For Mel by Louise Donovan. The quilt was made as a gift to mark Mel, Dan, Jake and Finn’s start of their new life in Canada. 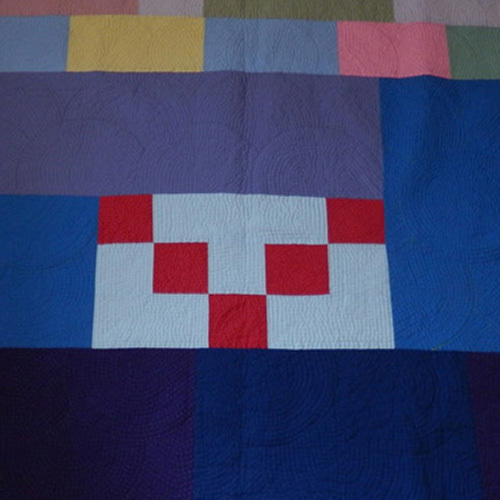 The ideas for the quilt floated around in my mind from March 2011. Various designs were drawn and rejected as not portraying what I intended. The design was finally drawn on Sunday 13th November 2011. By Monday 21st November it had been cut out and sewn together. Other quilts were being quilted at this time. On Friday 30th December 2011 it was backed, wadded and pinned ready for quilting. On 7th March 2012 the quilting was finished, the edge hemming started and the hanging sleeve made. It was finished on Tuesday 20th March 2012.It was completed while I was in St Ives, Cornwall for a week’s break combined with an art course. My patchwork quilts have been inspired by the Amish, so I do use strong plain coloured fabrics. At the time of making Mel’s quilt many other influences had come in – the work of one of the first quilt artists, an American Nancy Crow who uses strips to create her colourful designs, the quilts of a Black American community in Gees Bend and the Bosna Quilts made by a group of Bosnian women while refugees in Austria. My work at the time of making Mel’s quilt has also been shaped by three courses I took at the St Ives School of Painting. Two quilts made since then are due to be exhibited this coming August. When thinking of the design and what I wanted the quilt to represent I kept thinking of the row of red roses on the back of Mel’s very beautiful wedding dress. 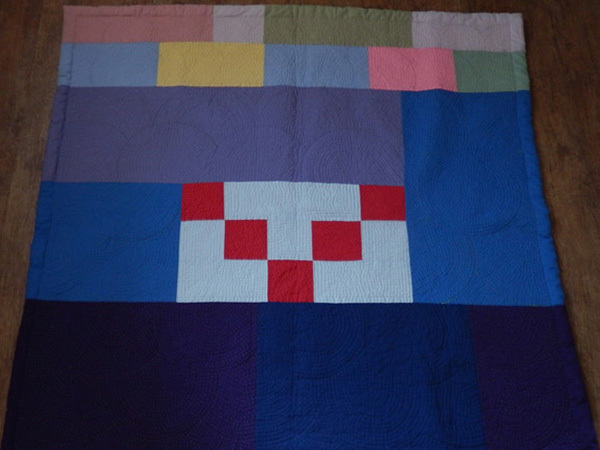 The centre of the quilt is inspired by this and I have used it to represent what I see as the core of Mel’s life – her commitment to and love of Dan, Jake and Finn. It is from this strong centre that she is now moving out to the world as well as helping Jake and Finn to be the special beings they are, to forefil their own potential and find their own path in life. The Amish say that in each life there is both sunshine and shadow – something Mel is aware of. Her journey through life has meant that she can reach out to others and this is seen in her friendships and that at the time of making the quilt she is looking for the right way for her to use her talents to help others in their own journeys. At the start of April 2011 she, Dan, Jake and Finn set out for a new life in Canada. The quilt was made as a tribute to this adventure and to represent it. It is also to say “Thank you for your friendship”.